The benefits of pancreatic enzyme replacement therapy (PERT) in chronic pancreatitis (CP) are inadequately defined. Daniel de la Iglesia-García et al have undertaken a systematic review and meta-analysis of randomised controlled trials of PERT to determine the efficacy of this therapy in exocrine pancreatic insufficiency (EPI) from CP. A total of 17 studies (511 patients with CP) were included and assessed qualitatively (Jadad score). Quantitative data were synthesised from 14 studies. Pancreatic enzyme replacement therapy improved CFA compared with baseline and placebo. PERT improved coefficient of nitrogen absorption, reduced faecal fat excretion, faecal nitrogen excretion, faecal weight and abdominal pain, without significant adverse events. Follow-up studies demonstrated that PERT increased serum nutritional parameters, improved GI symptoms and quality of life without significant adverse events. High-dose or enteric-coated enzymes showed a trend to greater effectiveness than low-dose or non-coated comparisons, respectively. Subgroup, sensitive and meta-regression analyses revealed that sample size, CP diagnostic criteria, study design and enzyme dose contributed to heterogeneity; data on health inequalities were lacking. The researchers concluded that Pancreatic enzyme replacement therapy is indicated to correct EPI and malnutrition in CP and may be improved by higher doses, enteric coating, administration during food and acid suppression. Further studies are required to determine optimal regimens, the impact of health inequalities and long-term effects on nutrition. 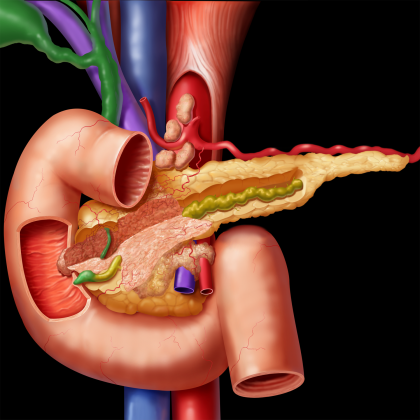 Chronic pancreatitis is a long-standing inflammation of the pancreas that alters the organ’s normal structure and functions. It can present as episodes of acute inflammation in a previously injured pancreas, or as chronic damage with persistent pain or malabsorption. It is a disease process characterized by irreversible damage to the pancreas as distinct from reversible changes in acute pancreatitis. CP has an annual incidence of 4–12 per 100 000, increasing worldwide. Aetiologies include environmental toxins (prolonged, heavy alcohol exposure and cigarette smoking), hyperlipidaemia, single and/or multiple genetic mutations (PRSS1, SPINK1, CTRC, CASR, CFTR, CLDN2 and CPA1) and autoimmune disease.